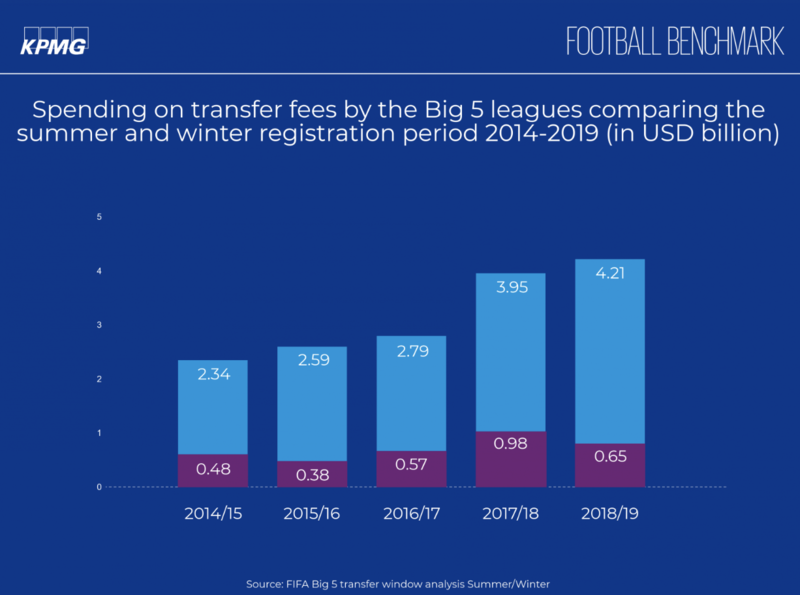 February 8 – The spectacular drop in spending in the January transfer window of $325 million ($979 million in 2018 vs $654 million in 2019) is examined in the latest report from the KPMG Football Benchmark team. 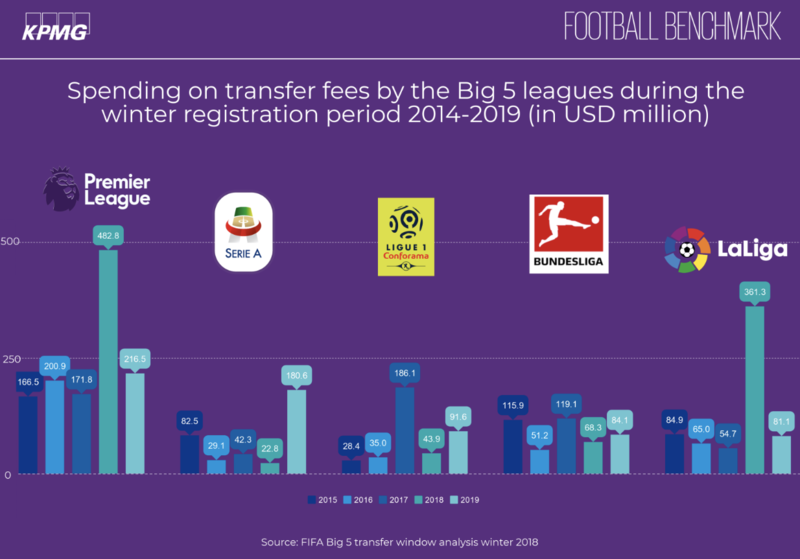 The biggest difference in the transfer window just completed is that there wasn’t the mega-spend on big names seen in previous windows though there were a “a few high-profile, strategic transfers”, says the analysis. 20-year old American, Christian Pulisic moved from Borussia Dortmund to Chelsea for €64 million, while Dutchman Frenkie De Jong will transfer from Ajax to Barcelona in the next transfer window for €74 million. “AC Milan was among the high spenders, signing Lucas Paquetá and Krzysztof Piatek for €35 million each – these two transfers alone produced almost half of the total spending in Serie A,” says the report. The fees for these players were significantly higher than their market value indicated by the KPMG Player Valuation tool. KPMG’s Global Head of Sports Andrea Sartori says the trend to look at here is the age of the players, and the requirement by clubs to recruit to fill a specific position where they have an injury crisis. “One factor to highlight is age, especially as the average age of the 10 players included in our analysis is below 24 years. As our valuation is largely driven by on-pitch performance, the sample size of professional matches played by very young talents is often quite small, resulting in modest value estimates. On the other hand, when there is a contingency, for example when a club is in urgent need to secure a good player for a position, because of the injury of one of his players, the same club is willing to pay a premium. In addition, a spell of exceptional form in the short term, like in the case of Piatek for example, can make prices surge. The financial status of the buyer club, a release clause built in the contract of a player, or the player’s willingness to leave his club are further factors that can lead to a sizeable gap between market value and transfer fee,” said Sartori. Sartori also points to an increasing trend to loan players citing Higuain’s move on loan to Chelsea from Juventus until the end of the current season. Chelsea can extend the loan until June 2020, for €18 million to be paid in 2019-20 financial year, or can sign the 31-year old Argentine striker on a permanent basis for €36 million. That loan triggered Alvaro Morato’s 18-month loan to Atletico Madrid. It seems clubs are trending towards testing players on loan to see if they have an impact rather than immediately committing to the big bucks unless they have to. This is especially the case with younger players with the report highlighting Chelsea’s loaning of 11 young player in the last window. Selling younger players can result in a big loss. Manchester City sold Jadon Sancho to Dortmund for €7.84 million in August 2017. The 18-year-old now has a market value of €46 million, according to the KPMG Player Valuation tool. Bayern Munich are chasing down Chelsea’s Callum Hudson-Odoi and offered a reported €35 million offer for the 18-year old English striker which was turned down. It is expected that they will renew the chase in the Summer window, most likely needing to pay more if Hudson-Odoi’s season goes well between now and then. But for that to happen he will need to get playing time.